With only two weeks until the election, it is truly disappointing that Senator John McCain has not reached out to independent competent economic advisors. Instead, he is using “Joe The Plumber” to articulate a message that is inaccurate and nonsensical. History seems to be repeating itself for McCain. It was in the 1980’s that McCain played the key role in promoting Charles Keating in what was a veritable factory of financial fraud in the Savings and Loan Industry. Today 20 years later he has aligned himself with UBS Vice Chairman Phil Gramm at a time when UBS is a key player in several massive financial frauds ranging from selling fake municipal securities to affluent investors, so called auction rate securities, in addition to numerous toxic derivative products to others. UBS stock has plummeted as a result. The contrast between McCain’s strategy and that of Barack Obama is striking. 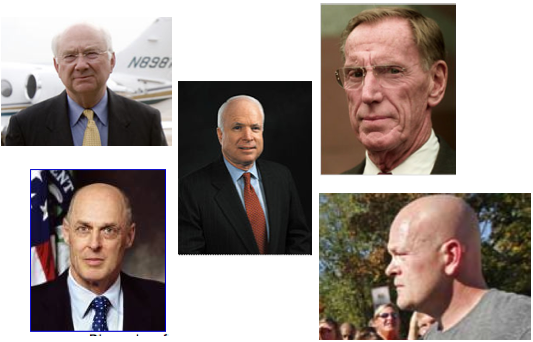 While McCain is surrounded by incompetence and advocating Henry Paulson’s well known “I am the master of the universe” perspectives and lifestyle, Obama seems obsessed with binding himself to pure competence, as summarized in an excellent article in today’s Wall Street Journal by Monica Langley titled “Volcker becomes part of Obama brain trust. 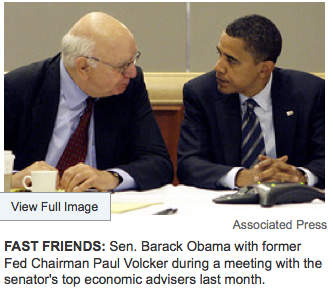 Volcker is worshipped in financial circles, by both Democrats and Republicans alike. They are pictured below.